MID-SUMMER IS PEAK SEASON FOR TOMATOES. Given their popularity on salads, pastas and sauces today, it’s hard to believe that Americans didn’t began eating tomatoes until several hundred years ago – despite their long existence. Today, they are readily enjoyed for their flavor, simplicity and health benefits. Tomatoes are part of a healthy grocery list for numerous reasons. They are best known for their extremely high content of antioxidant, due largely to lycopene, according to World’s Healthiest Foods. 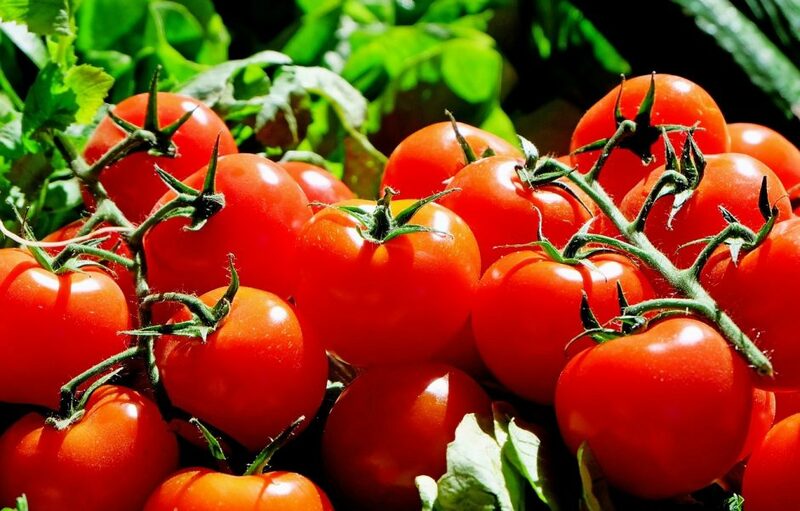 Recently, researchers have found several links between lycopene – a carotenoid antioxidant – and cancer-preventing properties as well as bone health. Of all cancers, prostate cancer has been most researched in regards to tomato intake and health. A key nutrient in this red vegetable – alpha-tomatine – has been found to change metabolic activity in growing prostate cancer cells. Continued research on tomatoes and non-small cell lung cancer, pancreatic cancer and breast cancer has also pointed to improved health. Tomatoes have also been linked to heart health, most notably that consumption has been related to decreased LDL cholesterol as well as decreased total cholesterol. Moreover, the antioxidant protection provided by tomatoes is essential for the cardiovascular system. Additionally, tomatoes are great sources of vitamins E and C, beta-carotene and fiber, and when it comes to phytonutrients, tomatoes may be one of the richest food sources. They contain everything from flavonols and flavonones to carotenoids and fatty acid derivatives, to name a few. Wondering whether or not cooking changes the nutritional value of tomatoes? Roma: With few seeds, low water content and firm texture, Roma tomatoes are best for sauces and canning. Beefsteak: Perfect for slicing, Beefsteak tomatoes are juicy, fragrant and best on sandwiches. Generally, they’re only good at their peak. Cherry: Small, red and typically sweeter than other varieties, cherry tomatoes are best for snacking, stuffing or adding to salads and pastas. Grape: Similar to cherry tomatoes, these small and oblong tomatoes are great for snacking and salads. Campari: Smaller in size than normal tomatoes on the vine but bigger than cherry tomatoes, Camparis are globe-shaped and and have a rich tomato aroma. Kumato: Brownish-red and maroon in color, these tomatoes from Spain are tarter than their counterparts, with a lower water content. Heirloom, specialty, and farmer’s market tomatoes include Garden Peach, Cherokee Purple, San Marzano, Green Zebra, Yellow Pear, Sungold and Brandywine, according to the source. Less conventional than the aforementioned tomatoes, these ones are often more expensive and come in a wide variety of sizes, shapes and hues. If tomatoes are ripe, they’re best stored at room temperature, according to Chef Anthony. Storing them on your counter or windowsill requires mindfulness and care as cuts or gashes to the tomato will attract fruit flies. If they’re reaching their peak ripeness, it’s best to refrigerate. Regardless of how you store them, tomatoes are best consumed at room temperature. Tomatoes can be roasted, grilled, sautéed or enjoyed as is.